Federal officials said the city and Con Edison both played parts in the deadly explosion that killed eight people in March 2014. 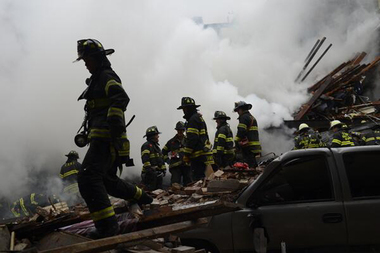 EAST HARLEM — Federal investigators said both Con Edison and the city were to blame for the gas-leak explosion that killed eight people and destroyed two buildings in March 2014. A faulty weld in the gas pipe maintained by the utility company and erosion under the pipe, which the Department of Environmental Protection ignored for nearly a decade, allowed gas to fill the buildings, according to the National Transportation Safety Board. The worker who installed the defective line at 1644 Park Ave. in December 2011 was one of 186 Con Ed welders who had outdated qualifications. If the joint had been installed properly, it would not have cracked because of the erosion, according to investigators. Supporting soil under the gas line had been washing into the sewer through a hole in the sewer wall for years. As the soil washed away, the gas line sagged. The city repaired roads above the erosion six times since 2004, including less than a week before the explosion. Had they repaired the sewer main, the gas main would not have sagged, according to the report. Both Con Edison and the city blamed each other for causing the accident while saying they have taken many steps to address any safety concerns. “The facts revealed that damage to the sewer and the road depression above it were localized events which had no causal connection to the failure of Con Ed’s gas service connection,” the city's statement said. Con Edison blamed the city for the sewer breach that undermined the soil supporting the gas line. The NTSB's report contradicts Con Ed's statement, saying the water main was cracked after the explosion and that, although other cracks on the gas line were caused after the explosion, the leak in the joint occurred before. Investigators also looked into what caused the explosion, the emergency response, and what the city and Con Edison can do to avoid similar emergencies in the future. “Once the leak was reported, Con Edison neglected to notify the fire department” said NTSB chairman Christopher Hart. A follow-up call was never made, according to the report. Had the FDNY been notified, firefighters would’ve arrived at the site 15 minutes before the explosion, investigators said. However, it is uncertain if they would’ve been able to evacuate both buildings before the 9:30 a.m. blast, investigators said. The NTSB issued six safety recommendations, including one to the city to implement a written procedure to ensure the integrity of their sewer lines and repair breaches in a timely manner. Four recommendations to Con Edison include revising their welding procedures and providing clear written guidance to gas emergency response staff to properly notify FDNY. The last recommendation was to the New York State Public Service Commission, asking it to revise its gas utility operator program to ensure all elements of the regulations are included in a five-year audit plan.